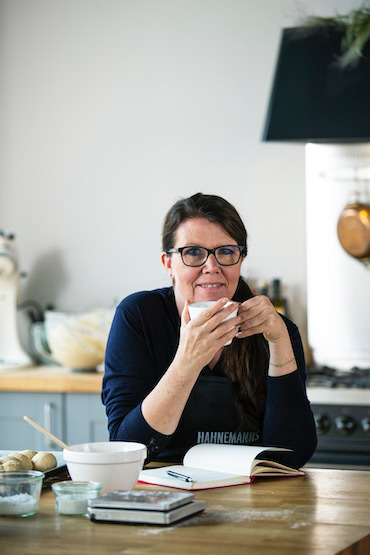 Trine Hahnemann is a well-known personality in Danish food and food culture. As the owner and CEO of Hahnemanns Køkken she is behind about 3000 daily lunches in private and public companies in the Copenhagen area. The company works towards a sustainable lunch. A chef and food writer, she is an enthusiastic advocate for sustainable solutions, organic sourcing and food cooked with love. Trine spends her time cooking, writing, and is often used as a keynote speaker across the world. She has talked and cooked at TEDxKrakow and at The Nordic Council of Ministers event at Rio+20. She is the co-founder of the on- going Rye Bread Project launched in NYC. Co-author on a book about Syrian culture and food and in that connection Trine works with young Syrian refugees to spread the joy of Syrian food. Trine has written nine cookbooks in her native Danish and also four in English, The Scandinavian Cookbook (2008), The Nordic Diet (2009), Scandinavian Christmas (2012), and Scandinavian Baking (2014) all published by Quadrille. Scandinavian Comfort Food published October 2016 in UK and US. She writes and appears regularly in magazines and newspapers in America and Britain. Both her books Scandinavian Baking and Scandinavian Comfort Food serialised in the Observer Magazine. She has appeared on the Great British Bake Off and has been a guest on the BBC ONE flagship food programme Saturday Kitchen. Been a guest on BBC4 iconic radio program Woman’s hour. Trine has two children, lives in Copenhagen with her husband, and works part-time in London.